It’s very rare that you’ll own a pair of hearing aids that don’t need to be repaired at some point. These devices are so tiny and so technical that there are dozens of things that can go wrong. But, before you go running to an audiologist asking for help, there may be ways to sort out your problems on your own. If your hearing aid isn’t turning on – or isn’t producing any sound – then one quick fix could be to check the batteries. Turn off your device, carefully open the battery compartment and have a look inside. Check that the battery is inserted correctly and inspect it for any signs of corrosion. A corroded battery is usually the result of moisture getting into your device and it often causes problems like sound distortion. If you replace your battery and the device works correctly, then you know the issue was with the old battery and not your hearing aid. If your device is turned on and everything looks like it’s working fine – but there’s no sound – then you should visually inspect your hearing aids. Most audiologists will testify that earwax blockages are the cause of multiple hearing aid sound issues. Look around the microphone outlet to see if any wax or dirt is clogging it up. Likewise, inspect the part that inserts into your ear as this can often get blocked. Remove any dirt or wax you see, then test the device again. If it works, then you know what the problem was! Arguably the easiest DIY fix involves playing around with the volume controls on your hearing aids. Sometimes, you may accidentally turn the volume down, which is why you might not be hearing any sound or why it could be quieter than usual. So, before you go and see an audiologist complaining about a lack of sound, check the volume controls and turn them up. In a similar vein, if you have sound issues or there’s a lot of distortion, then it could be due to the settings in your device. Some hearing aids have multiple settings to work in different scenarios. For example, there’s the telecoil setting that you have to switch to when on the phone or in certain places. If you forget to change back to the standard setting, you may get lots of feedback through your device. So, alter the settings and see if that makes any difference. On the topic of feedback and distortion, this often occurs when your device doesn’t fit properly. So, one easy idea is to remove the hearing aid and reposition it in your ear. If you feel like it sits more tightly and is more secure, then turn it on and see if the feedback has gone. If it has, then the issue was merely to do with positioning. If your hearing aids have stopped working or are malfunctioning, then dry them out using a hairdryer. If this doesn’t help, then do the bowl of rice trick where you leave them to soak in uncooked rice overnight. It’s common for moisture to be the source of hearing aid malfunctions, so this will help you see if that was the problem. If nothing on this list solves your problem, then see an audiologist to get your device inspected. Likewise, never attempt any actual repairs by yourself. If your hearing aids have any broken parts, then they must be fixed by an expert. It can void the warranty if you try them yourself, not to mention the fact that you’ll probably cause more harm than good. Additionally, you should get your hearing aids looked at if they’ve been dropped on the floor as internal issues can regularly occur without you realizing. For any of you experiencing hearing aid issues that can’t be fixed by yourself, then please get in contact with us today. 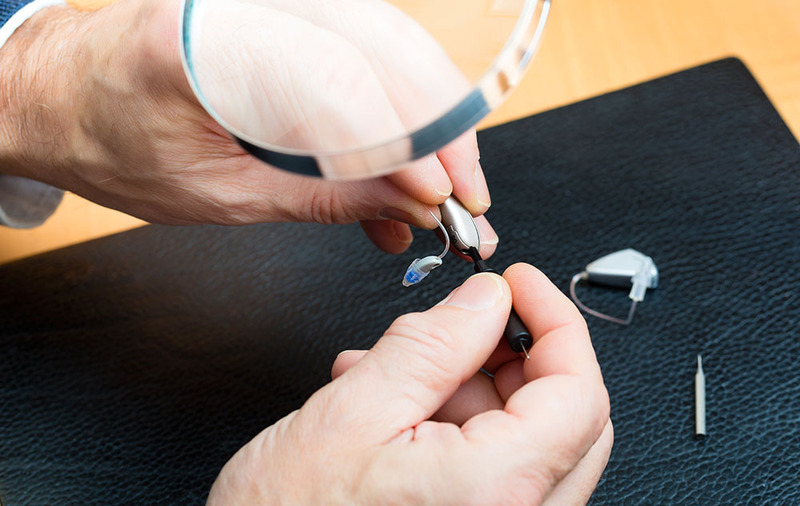 We will help you with any hearing aid repairs and can inspect your device for you. Give us a call at (920) 232-4752 and we’ll tell you more about our extensive hearing aids services.